GPT Tweaks - Powerful and FREE GPT Site Script MODs Resources and Advice! : Totally FREE Hard Copy Mailed Website Magazine One Year Plus Print Subscriptions to Web and Internet Professionals! No Catch! FREE HARD COPY MAILED WEBSITE MAGAZINE SUBSCRIPTIONS! 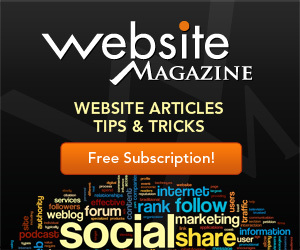 Internet / Web Professionals Get Your Totally FREE Hard Copy Mailed PRINT Edition Year+ Subscription to Website Magazine! Simply click the link or picture and answer a few questions (just to make sure you truly are an Internet / Web professional thereby qualifying) and telling them where to send your year plus long subscription to this award winning leading industry publication. Order Your FREE Website Magazine Subscription in Print / Hard Copy Form Here - Now!